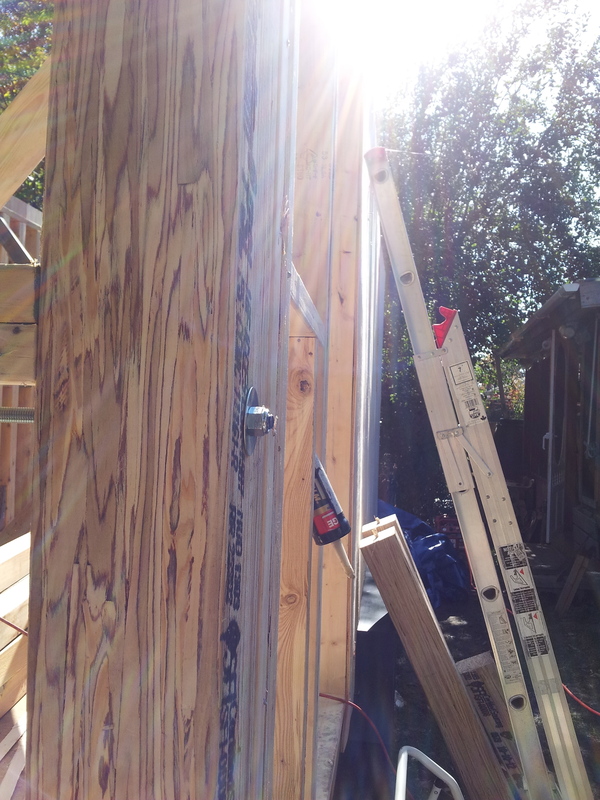 Last week, I had to delay building my roof because there was a delay at the sawmill where I ordered my ridge beam (which I keep wanting to call roof beam – new vocabularies make my brain work). 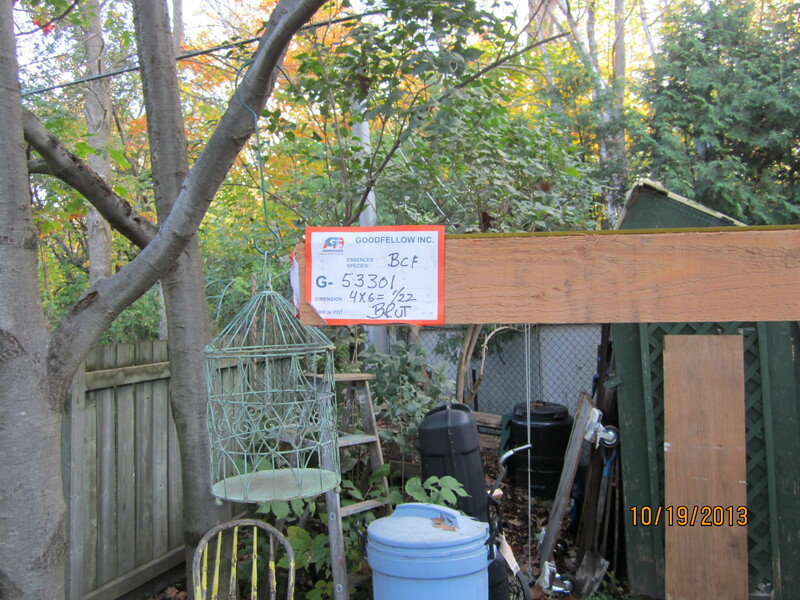 The 22′ 4″x6″ ridge beam was supposed to arrive Monday. 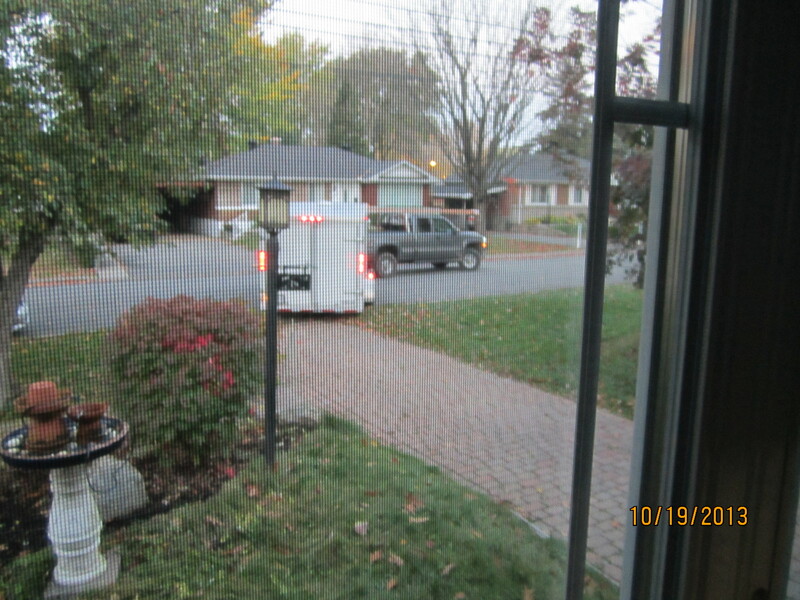 Tuesday, I heard nothing from them so I called to check in, my ridge beam would be delivered by Thursday. Thursday morning, I called them to check where things were at… they didn’t know if they had even received the lumber yet. I was not feeling very serene, calm or laid back as I waited for them to call me back to let me know if they had received it or not. I anxiously waited for them to call, I am not very good at waiting so I called them back and they had indeed received the lumber and they would deliver the next day. Here comes the ridge beam. 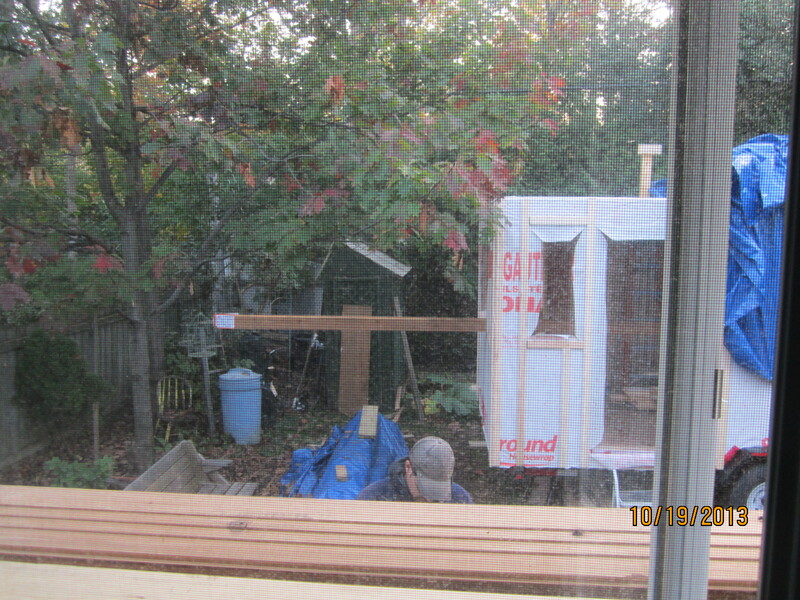 In the end my ridge beam, interior and exterior siding were delivered Saturday morning at 7:15am. Which worked out for the best as There was only one person delivering my order, if he had arrived Friday afternoon, I don’t think I would have been able to help him carry the ridge beam alone to my tiny house. 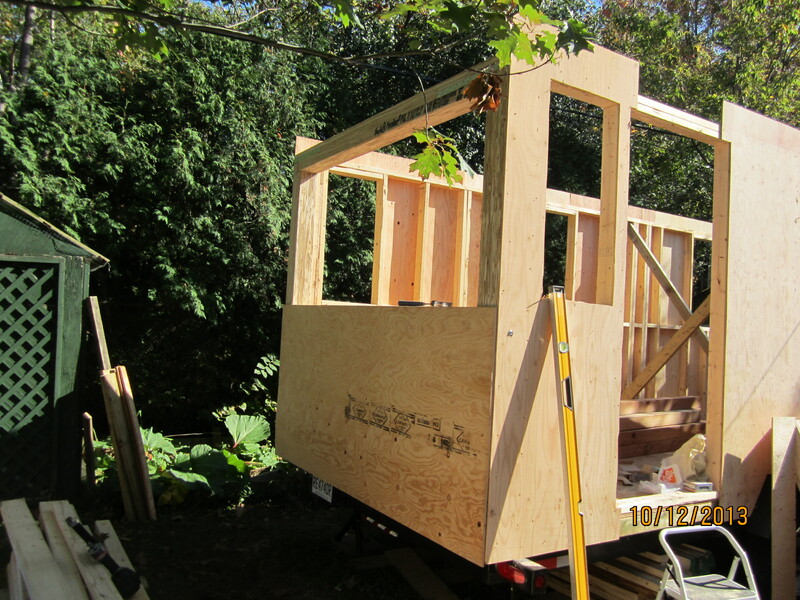 By the time he was ready to unload the ridge beam, Stefan had arrived and the ridge beam was unloaded. I tried to help, but being at least 6 inches shorter than both Stefan and the gentleman from the sawmill, I was of little help as they carried the ridge beam on their shoulders. The ridge beam sticking out of the large window opening. With the delivery all stowed away and the ridge beam hanging out of the large window opening, Stefan and I began working on the rafters. 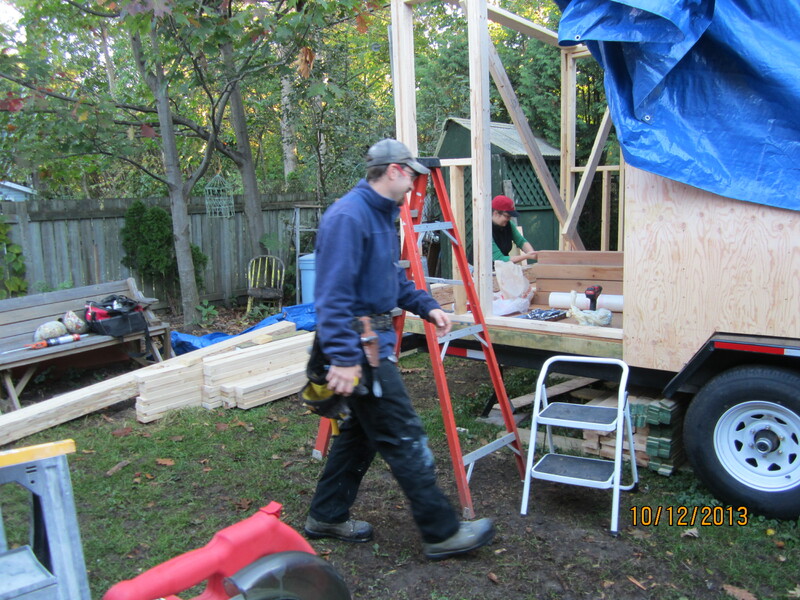 Stefan’s plan was to build the framing to support the ridge beam, get the ridge beam set in place, then build the 3 sections of roof at 45 degrees first, sheath them and then build the dormer sections of the roof. 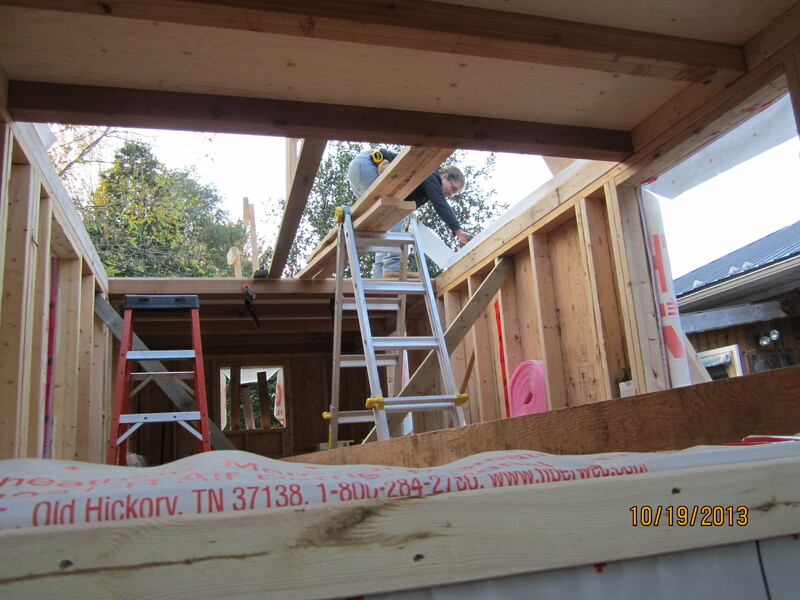 We also, as per the plans, attached the sole plate (the piece of wood on top of the loft framing that the rafters and dormer framing would be attached to) through the flooring into the loft framing with lag bolts. Julie and Julien, who attended the Yestermorrow course, were a great help. 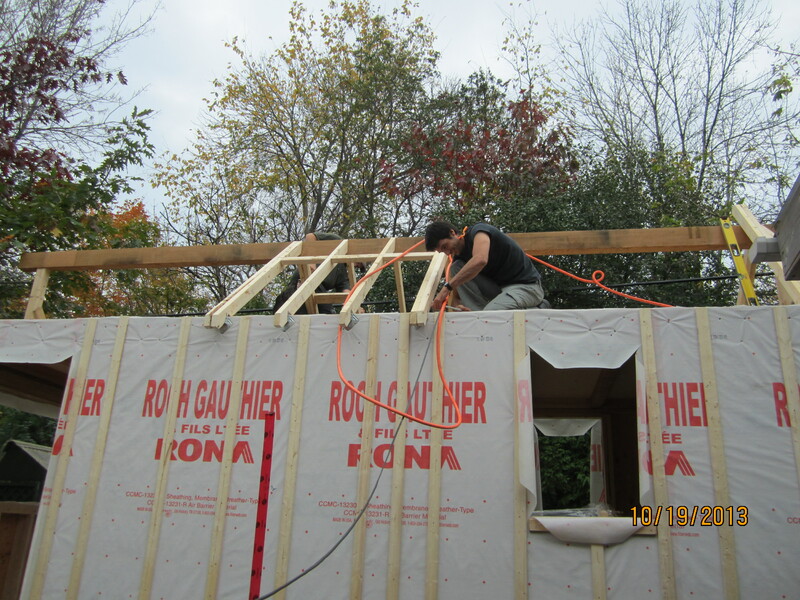 By the end of Saturday, the ridge beam was in place, the 45 degree sections of the roof were sheathed, the sole plate was firmly attached and we were ready to build some dormers. 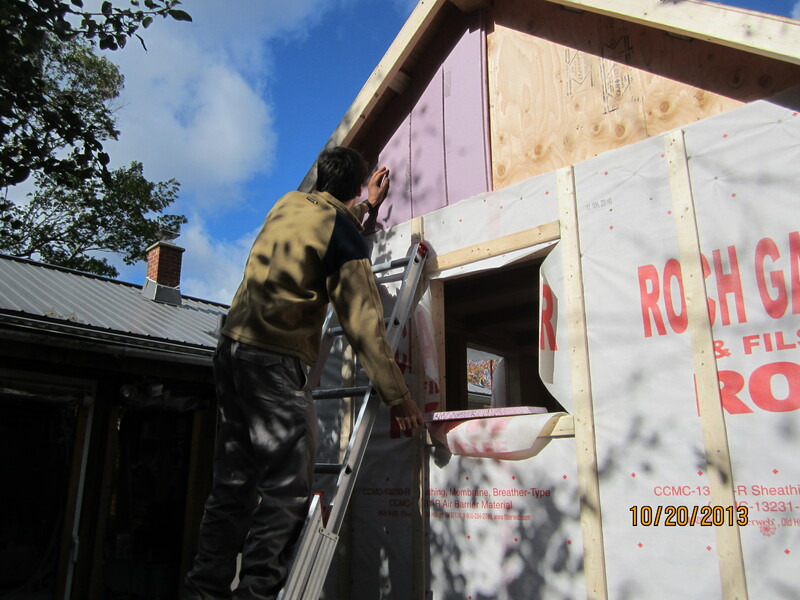 Sunday, saw the dormers built, one of the end sections of the house insulated, wrapped and the furring in place. A big Thank You to Julie and Julien for coming out and helping with my build. That’s my Goodfellow Ridge beam! 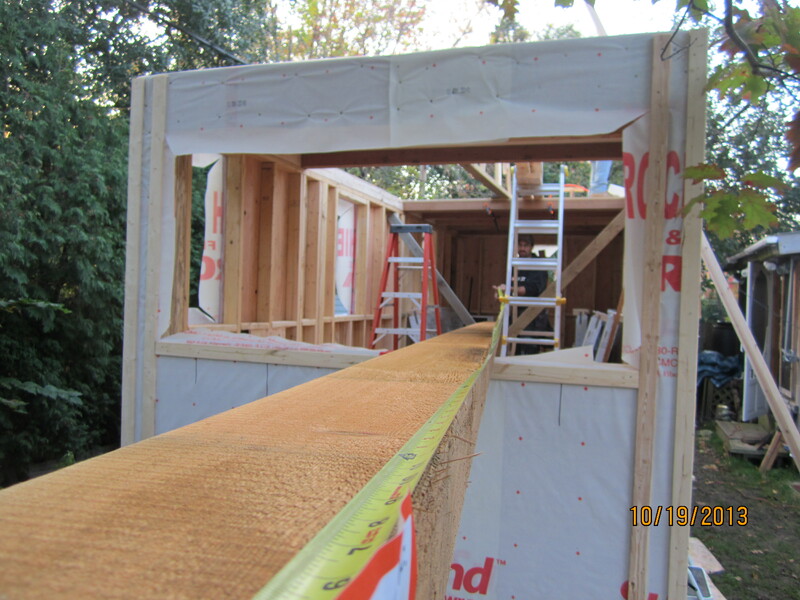 A beam’s view of my house. Cutting the extra house wrap off and installing the sill gasket before the sole plate goes on. Rafters going in and bolts being ratcheted. End wall insulation using the cut off sections from the insulation that went on the main walls. Each of the seams was covered with tuck tape. A house with dormer framing! The second weekend of building with Stefan was really good. We had hoped that my ridge been would be here so that we could start working on the rafters, but the sawmill was unable to deliver my 22′ 4×6 ridge beam. 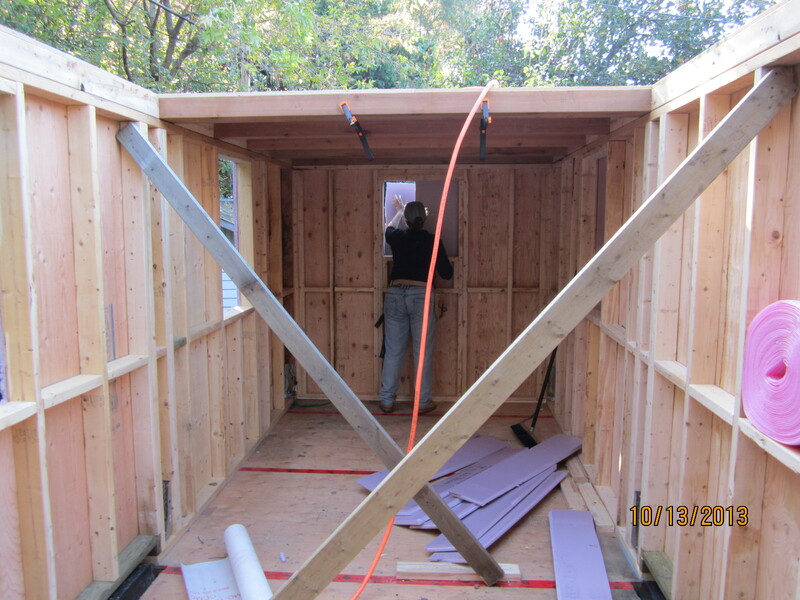 Plans were changed – instead of rafters, we set out to finish the 4th wall of the house and the 4 walls ready for siding. 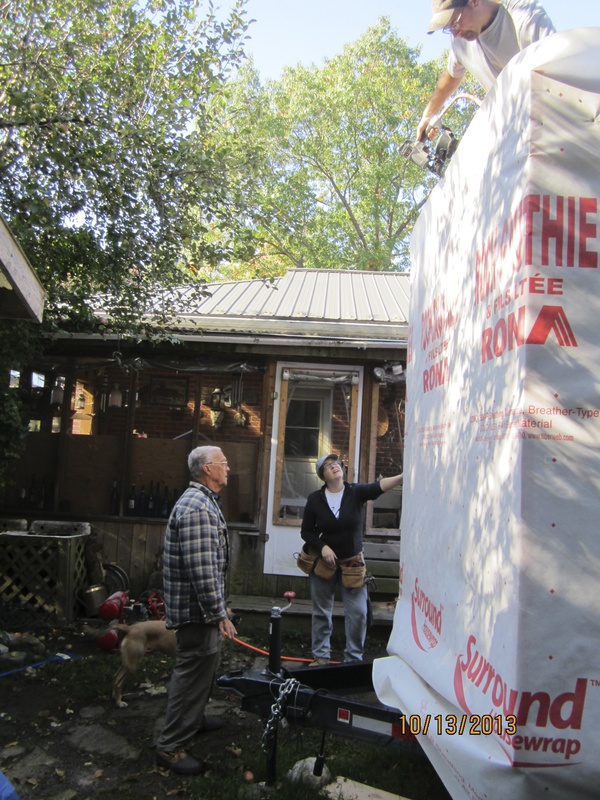 I ordered 4’x8′ sheets of 1″ extruded polystyrene insulation to put around the house to help increase the Rvalue of my walls. 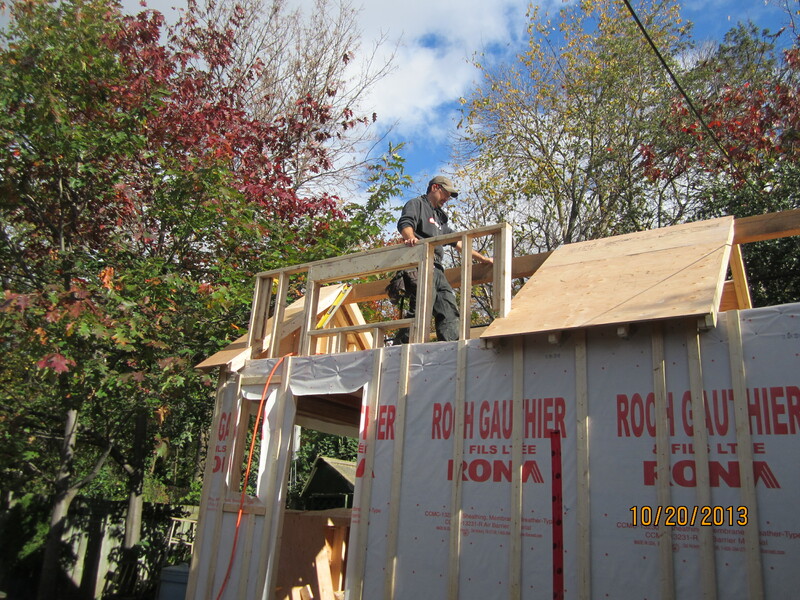 Code in Québec calls for R25 in walls – in order to get that kind of Rvalue in my walls and keep as much interior space as possible, the exterior walls have to be insulated as well. 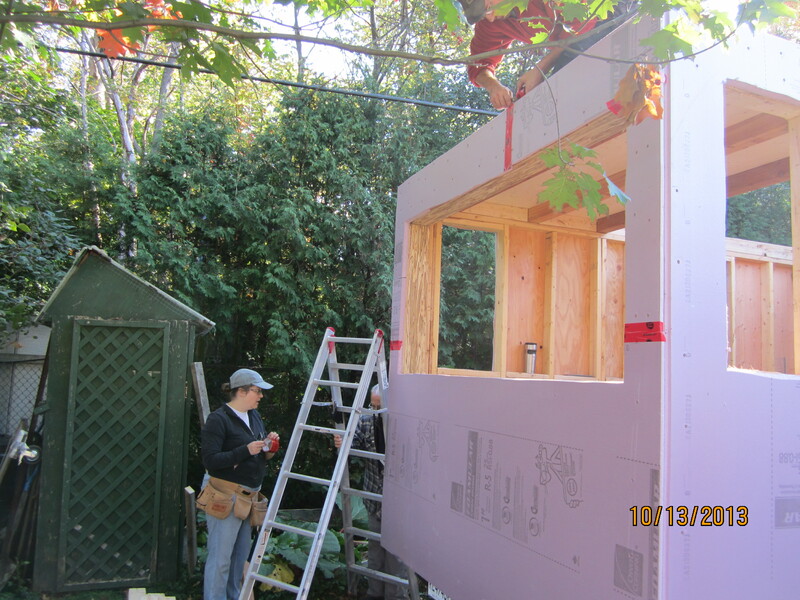 Before we insulated, we finished the 4th wall of the house which was different from the first three for several reasons. I have chosen to almost create a bay window in that end wall of the house. 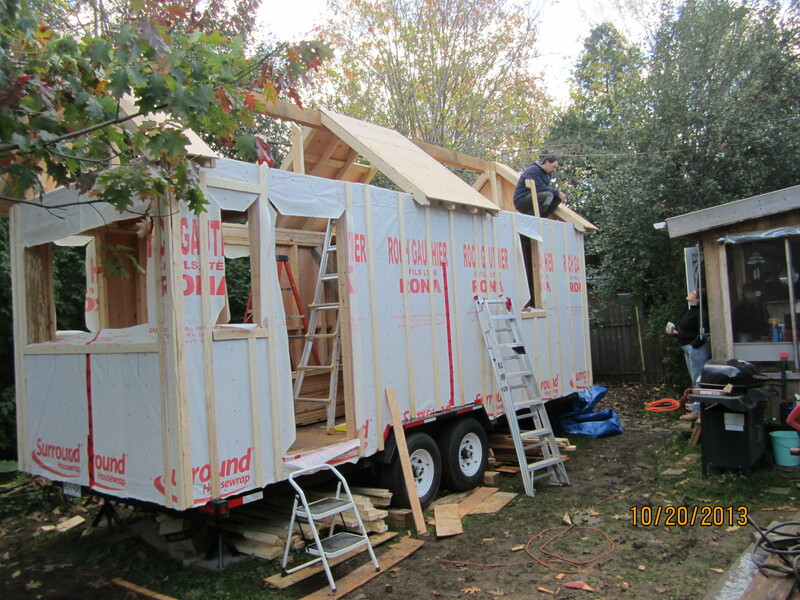 Doing so creates some interesting challenges in a tiny home. 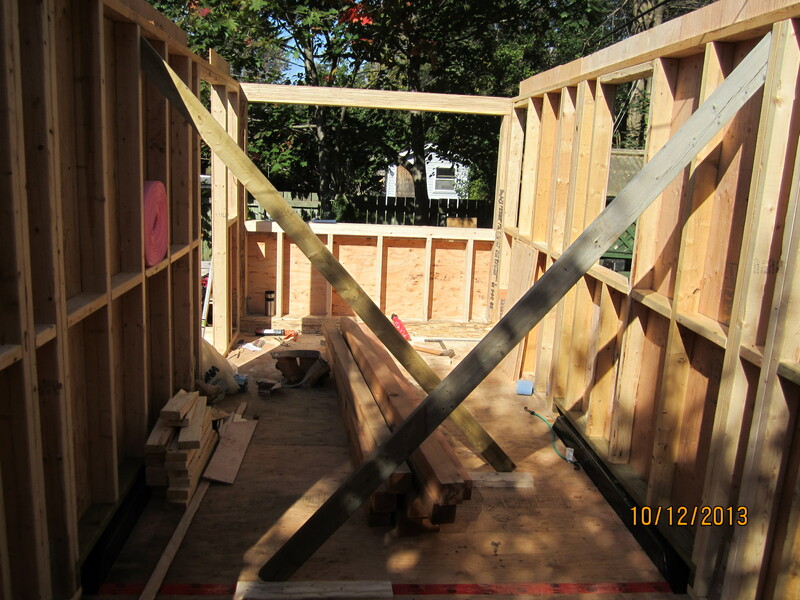 The plans for the house call for parallam posts and beams in that wall along with a threaded rod under the window and strapping around the edges. 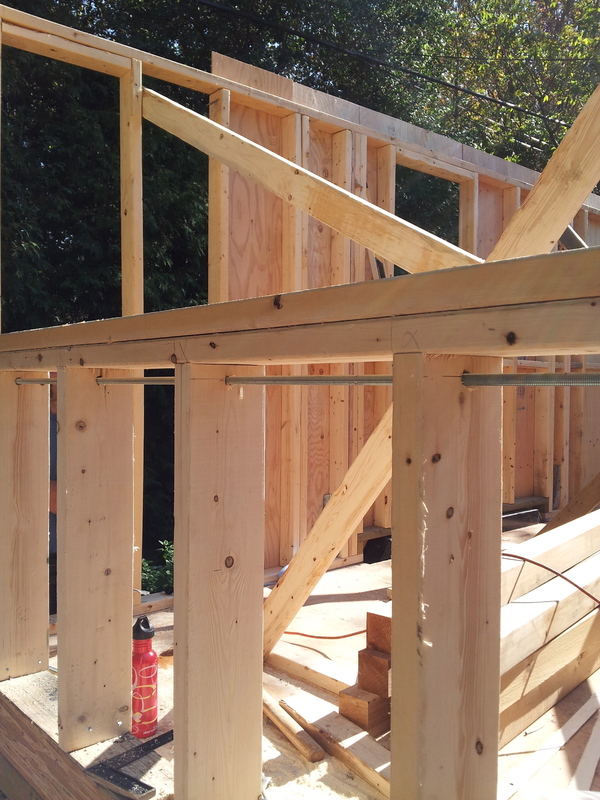 I could not find the exact posts and beams required and ended up with slightly smaller posts (1/4″ smaller on one side) and beams that were almost 2″ wider. Parallam is an engineered wood, quite beautiful to look at. It is also heavy. 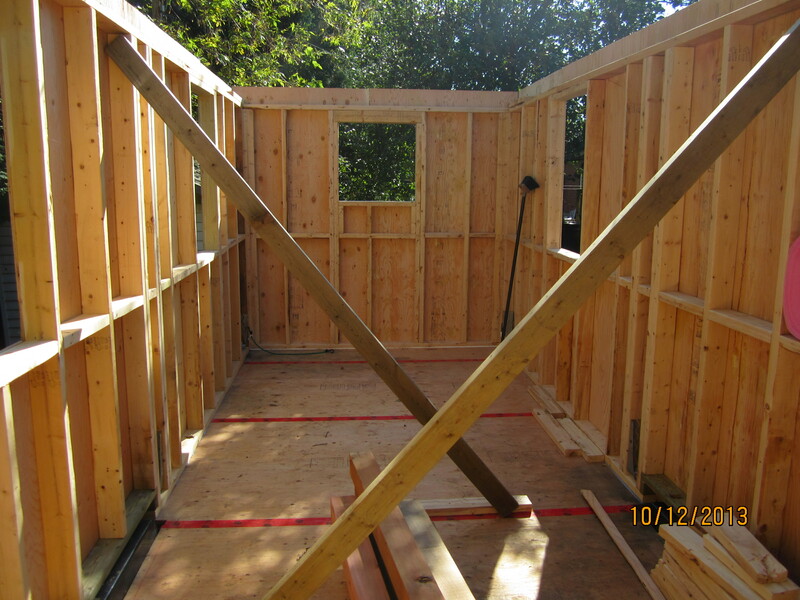 The wall went together pretty quickly and then we built the loft framing. 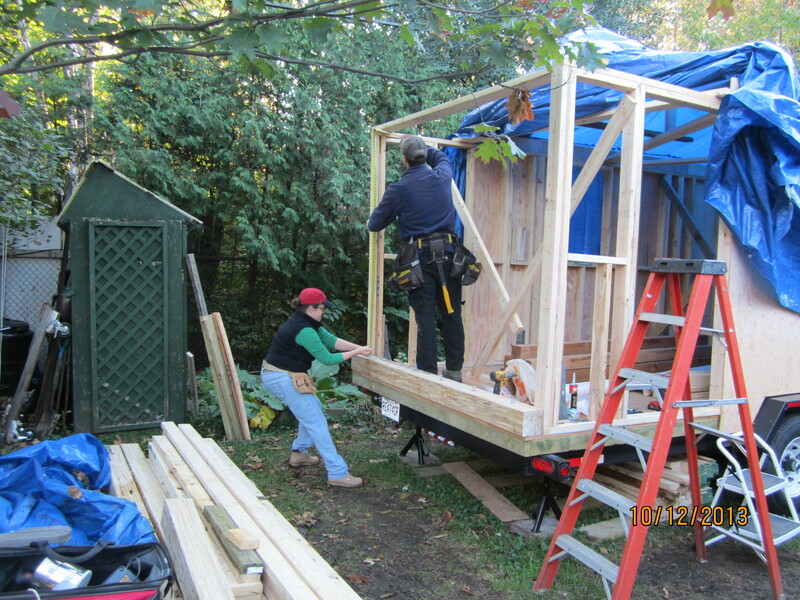 I am in the background ratcheting one of 6 8″ lag bolts into the parallam beam to attach it to the subfloor. That beam is not going anywhere. Stefan is measuring, I am daintily ratcheting a lag bolt. The threaded rod that goes through the wall. One end wall mostly sheathed. The view from what will be the kitchen. The view from the bay window into the rest of the house. 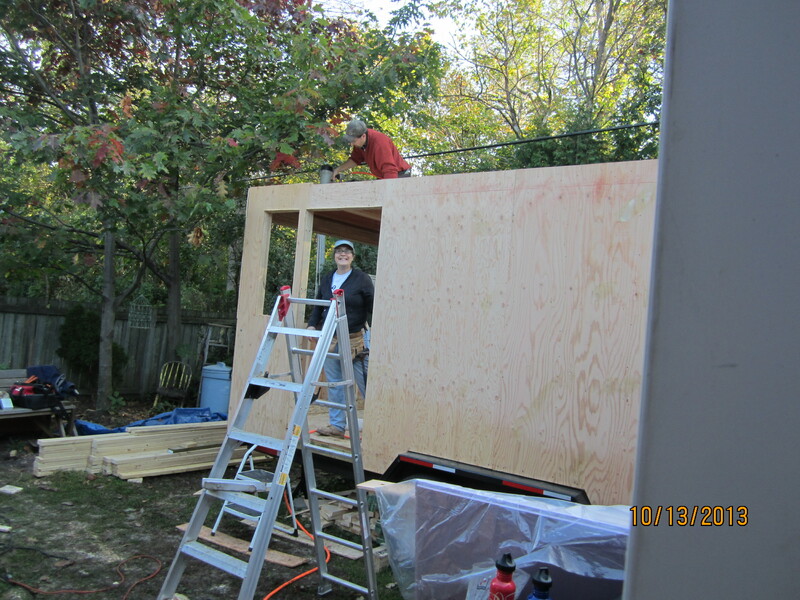 By the end of Saturday, we had the 4 walls built and sheathed. Sunday we only did a half day, we put up the insulation, wrapped the house with house wrap and then put up strapping until the nail gun ran out of nails. Not bad for a day and a half. I am generally not a morning person and yet here I am smiling early on a Sunday morning! 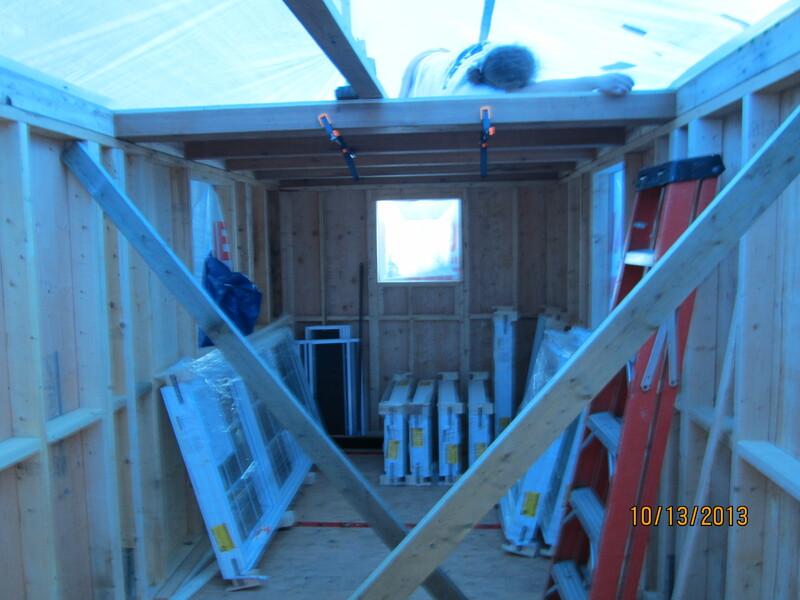 The large loft is in place. I chose to go with cedar 4″x4″ for the collar ties for both lofts. The plans called for my flooring to go directly on the collar ties, but Stefan suggested that we go with 5/8″ plywood first and the put the flooring over top. I am very pleased with that decision as that plywood has taken a beating. For those who are interested, I am cutting the window out of the insulation. My house all pretty in pink! Wrapping the house. 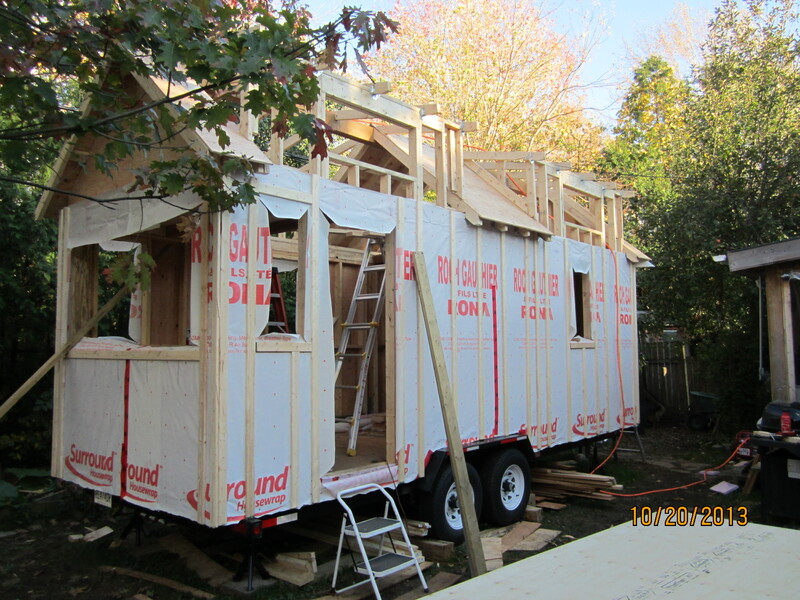 Stefan used roofing nails to keep the house wrap in place. 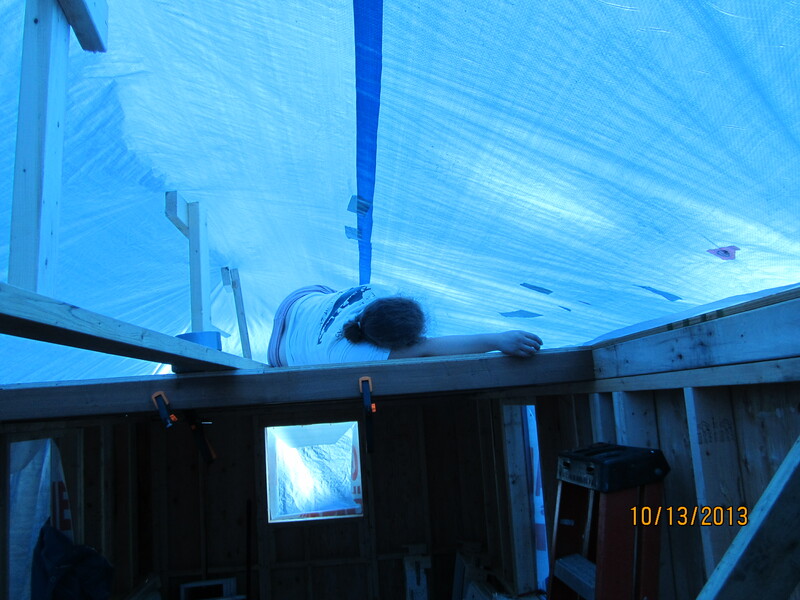 At the end of the day, I went up to the loft to repair some holes in the tarp and ended up falling asleep in my loft. Me still asleep and stored below me are my windows which arrived Saturday morning stored safely under the loft.